Members of Girl Scout Troop 390 and Exeter American Legion Auxiliary Post 218 met on Tuesday evening to spend some time picking up trash in Exeter. The group donned gloves and piled trash into the trailer pulled by a 4 wheeler that's use was donated by Jerry Peterson. After they finished the Legion Auxiliary treated the girls to a pop. 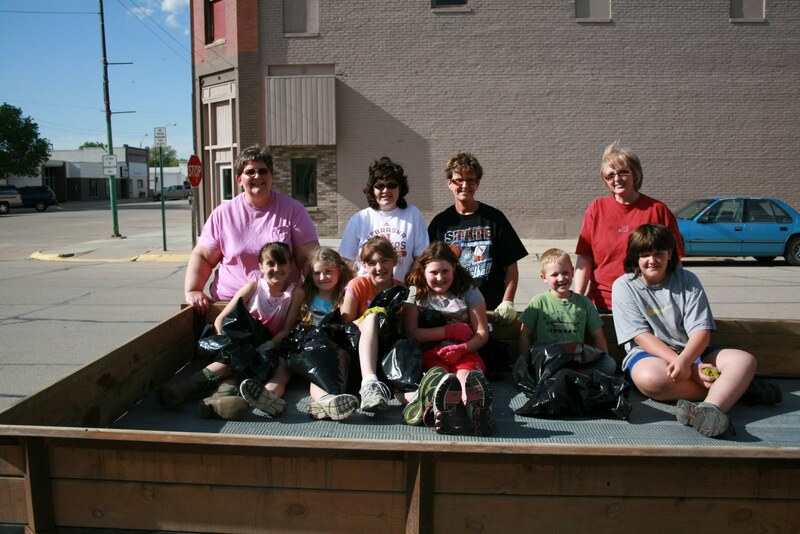 Pictured in the back row from the left are Girl Scout leaders Anita Mueller and Becky Erdkamp, Legion Auxiliary members Linda Underwood and Annette Gloystein. Front row from the left are girl scouts Josie Hulse, Janey Erdkamp, Hannah Beethe, Vickie Androyna, helper Casey Underwood and scout Tara Mueller. Time to Sign up For Summer Reading Program! !